New paintings and sculpture by Thames-Side Studios-based Billy Crosby (b. 1992, Dumfries and Galloway). Crosby completed his BA (Hons) in Fine Art Painting at Camberwell College of Arts and was a John Moores Painting Prize 2018 Prize Winner. A superorganism can be defined as a collection of agents which can act in concert to produce phenomena governed by the collective. The term is most often used to describe a social unit of eusocial animals, such as bees or ants, where division of labour is highly specialised and where individuals are not able to survive by themselves for extended periods. The paintings have been worked on simultaneously or in quick succession in the studio. Excess from paintings is used to imprint other canvases, canvases are stacked and paint soaked through one onto another, paint left in the spray gun after finishing one painting is used as another’s starting point and polystyrene has found its way onto the canvases. The paints used are readymade factory colours, any mixing that has gone on has been either wet on wet on canvas or where the run-off has pooled on the floor and mixed. Superorganisms convey activity. Traces of activity can be read in the indexical marks on the paintings, maybe pointing to a different painting or suggesting where another could be. These painterly signs register activity as happening somewhere not just limited to a single canvas but between paintings, each reinforcing or destabilising the next. A chain link mutually depends on another chain link in order to be a chain. Rising from the floor they echo the upright formations created by many of the superorganisms found in nature. 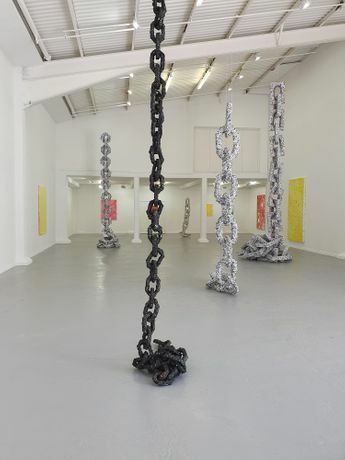 The chains can also be thought of as symbolic representations of paintings history as a series of links, reactions or progressions. Billy Crosby b.1992, Dumfries and Galloway, Scotland. BA (Hons) Fine Art Painting, Camberwell College of Arts, London, 2013-2016. Billy has shown in the UK and internationally and lives and works in London. Recent solo shows include Boiling Frogs, Interview Room, London (2018) and Props, Camberwell Space, London (2017). Recent group shows include Paper Cuts, Saatchi Gallery, London (2018); Pleasure Garden, Wickham Road, London (2018); Fatal Attraction, Thames-Side Studios Gallery, London (2018); Salt Castles, Lewisham Arthouse, London (2018); Changelings, The Flying Dutchman, London (2017); Solopreneur, Kingsgate Project Space, London (2016); Run Forrest Run, The Kennington Residency, London (2016). Billy was a prize winner at the John Moores Painting Prize (2018) and recipient of the Vanguard Prize (2017).